This is an extremely rare Crown Devon preserve pot produced in the 1930s by the Fielding factory in Stoke-on-Trent. It has the impressed number 622 on the underside, together with the Crown Devon mark dating it from the 1930s. 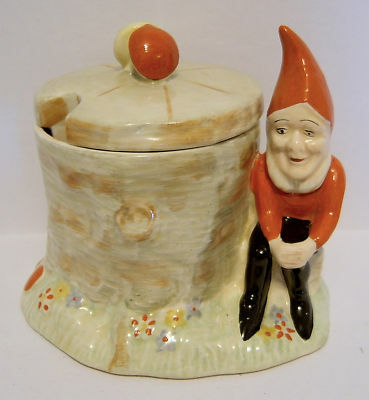 As can be seen, the gnome has a bright red top with black trousers and red pointed hat. There is a little rubbing to the top of this hat but otherwise, there is no damage or restoration work. The gnome has a very friendly face compared to the later editions which appeared rather more sinister. There is a little discolouration on the inside of the lip of the cover which cannot be seen until the lid is removed. There is no spoon. It measures 4.5 inches (11 cms) to the top of the finial and has a width of 4.75 cms (12.5 cms).